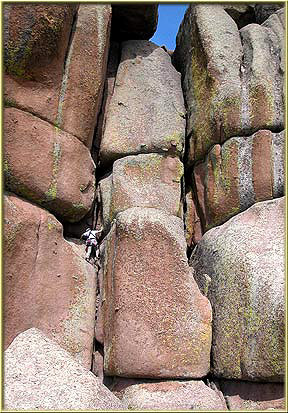 Hassler’s Hatbox is an aesthetic, miniature climbing amphitheater with over a dozen unusually adventurous, choice routes ranging from a 5.6 crack inside of a crack …. to a nearly unclimbable 5.12 off width called ‘LUCILLE’. You will be ‘above’ the crowd with no hassles, sharing company only with sometimes gusty breezes and raptors riding thermals above. Yes, this seemingly remote place is the home of the well-known, but seldom climbed world class off width called “LUCILLE”. 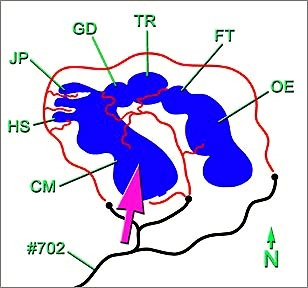 Also part of the area is a very large boulder found just north of the main area which sports two stout finger buster “mini-routes” put up by Piana and Skinner. There are at least two ways to get here. First, take any route up Walt’s Wall to the top and walk northward across the top of the Central Massif. Second, you can hike up the ‘backside’ of the Central Massif from the Box Canyon. You can’t miss this place once on top of the central massif, but you might want to check out …. 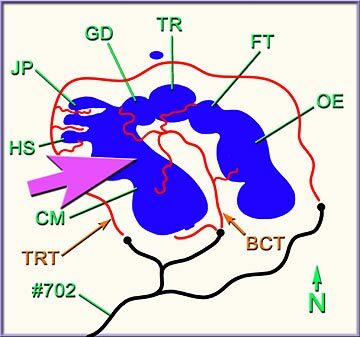 this map …. and this MAP anyway. Despite numerous attempts, ‘LUCILLE’, this so-called ‘innocent lady’, has seen very few free ascents. Some indicate the name may have been inspired from the movie “Cool Hand Luke”, a line spoken by George Kennedy’s character ‘Dragline’ which goes … “Any girl that looks that innocent just got to be called Lucille”. 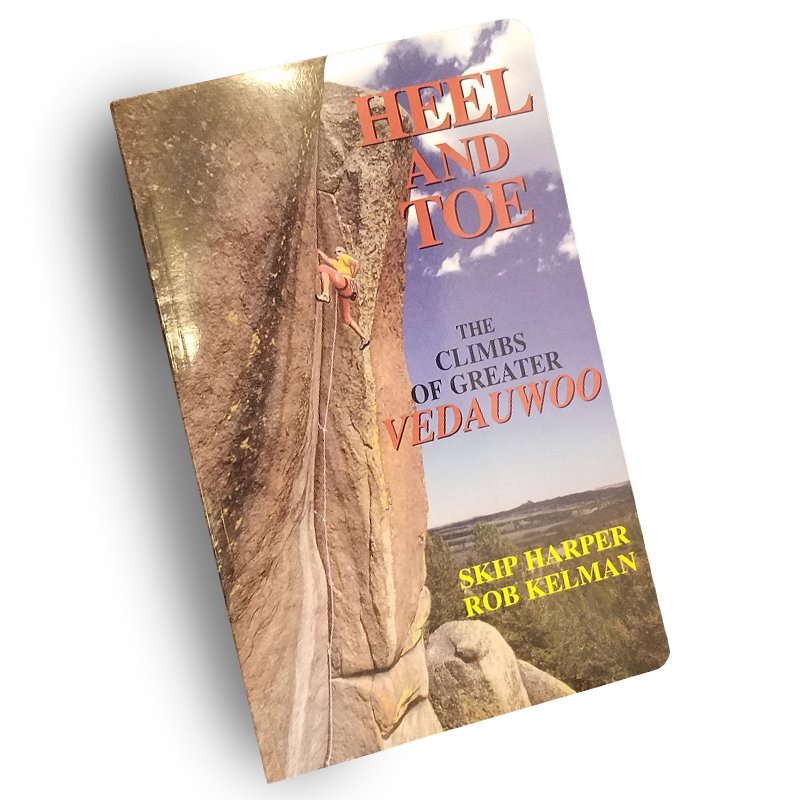 Cool Hand Luke has definitely influenced other climbs at Vedauwoo, especially on the Nautilus where there’s a ‘Cool Hand Luke’ area. However, to quote directly from the route’s author, Jay Anderson … “It had become known as Lucille after B. B. King’s guitar …”. 4.) Lucille 12c One big testpiece, a legendary offwidth. 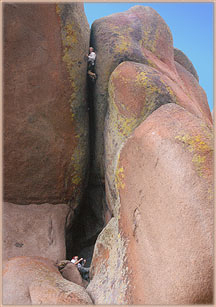 Climb either #2 or #3 to establish the belay. It’s SELF EXPLANATORY FROM HERE, a daunting, wide, overhanging gash where gravity will become your worst nightmare. If you’re up for this, Bring big pro, bro! For better or worse, some ASPIRING OW NUT has recently (’02) placed toprope bolts above the route, and even still – most aspiring offwidthers can’t cut it. (Anderson and Friedrichs, ’88) Seen in the photos on the right. 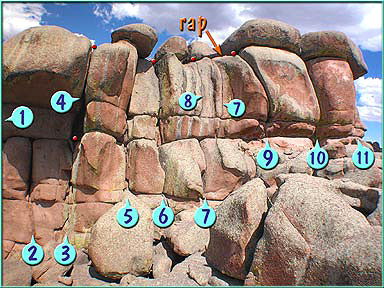 DESCENTS: There are rap anchors at the top of #7 and #11, and if all else fails, you can downclimb a fairly dicey groove on the north side of the formation. 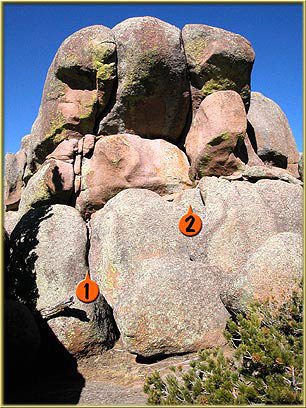 These two ‘FINGERBUSTERS’, ‘JIMI HANDTRICKS’ (#1) AND ‘MICK JAGGED’ (#2), are directly across from the north side of Hassler’s Hatbox. 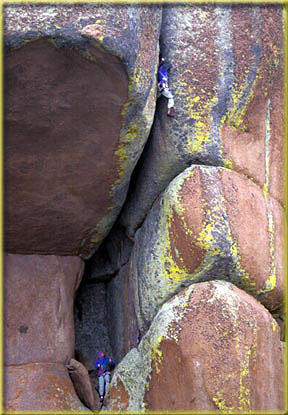 These two ‘MINI-ROUTES’, or hardass boulder problems were put in by Paul Piana and Todd Skinner in about ’79 – and are NOT documented elsewhere. I do not have the exact grades on these ‘diminutive routes’ (as Paul describes them), but you can bet they are hard 5.11 or more. The easiest access is probably taking the Box Canyon Trail (BCT) to near the top of Glen Dome and cutting back southwest about 400 yards up towards the backside (north face) of Hassler’s. 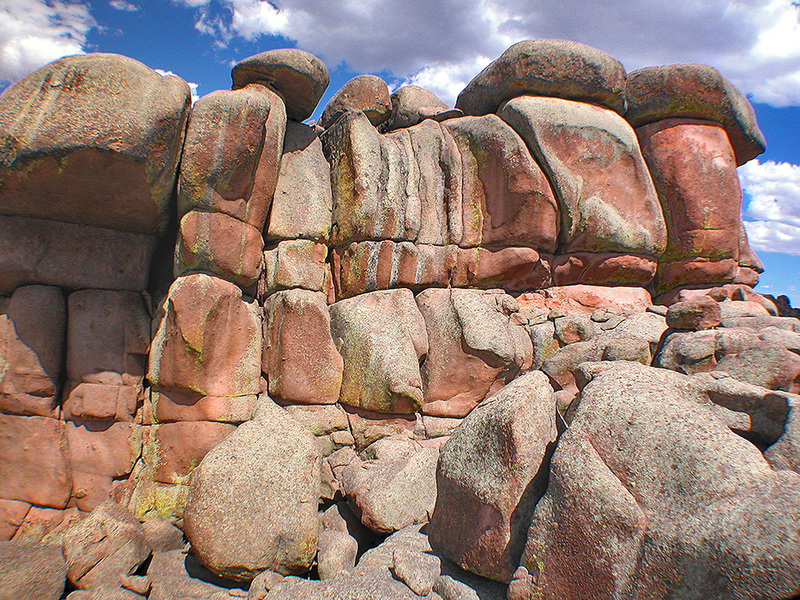 This large boulder sits atop the formation directly behind (north of) Hasslers.